When you are part of a body corporate, you need electricians who turn up on time, do a great job every time, charge reasonable rates and don’t mess up the paperwork. 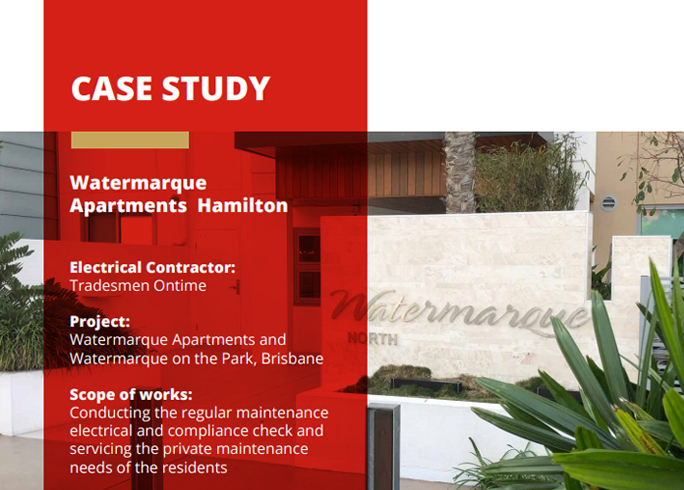 Tradesmen On Time electricians and electrical contractors are trusted by body corporates across Brisbane because they can rely on us to respond quickly and get the job done right. We offer programmed testing & inspections to ensure electrical compliance, as well as breakdown and repair services. Whether you need electrical maintenance for common areas, have new tenants moving in and want a thorough electrical safety check before they arrive, or are expanding your property, we can help! Equipment testing and tagging, and repair (accurate, reliable experienced). Smoke alarm testing, maintenance and replacement. New electrical installations and upgrades. Electrical safety inspections and audits. Green electrical audits, energy audits. If you are looking for a total electrical safety solution, we can combine your exit light testing with testing of your smoke alarms, emergency lighting, circuit breaker tests, safety switch tests and your electrical equipment test and tag process for a complete business safety service. We can also replace existing halogen bulb exit or emergency lighting options with more power efficient and long-lasting LED lighting options to help save your business money over the long term. Need help with your body corporate electrical work? Call us!